Happy World Book Day Yesterday! Yea I know I’m always a bit behind on stuff but still, happy world book day yesterday folks! World book day is a charity that celebrates books and reading, every year millions of children are given book tokens to spend on new books and are encouraged by schools and libraries to come together in reading and enjoying books. I think it’s an absolutely amazing thing as it gives kids a chance to own their own books as well as find out about other new and exciting material. Anyways, I got a lovely email the other day from the teacher of class 5/4 at Camstradden primary school in Drumchapel. 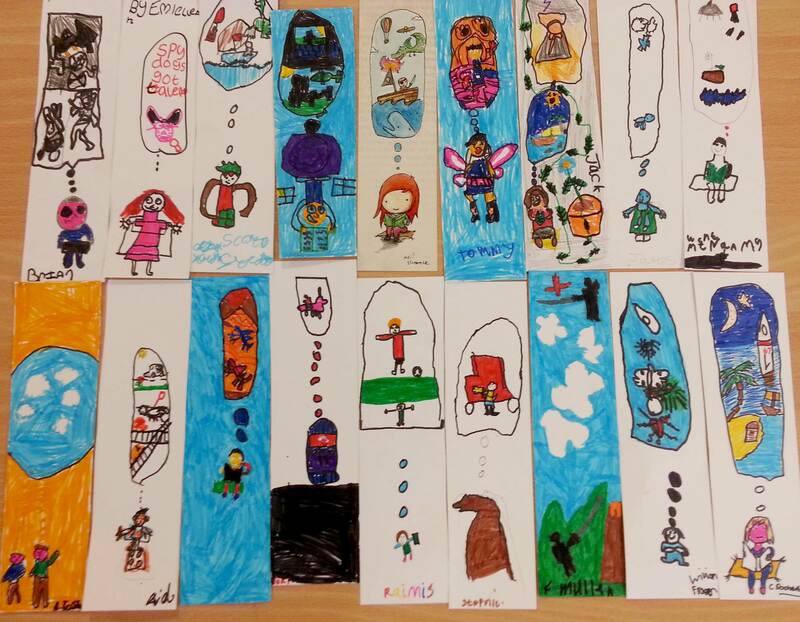 As part of world book day the class project was to make their own bookmarks about what books mean to them based on my Pushpin bookmark design. Look! How cool is that?! Needless to say this totally made my day. My original design (below) was me trying to illustrate what books mean to me and how they can take you to amazing far off lands and plunge you into adventure and it’s just so nice to see another person’s take on that. The original bookmark is available for £1 from Pushpinzines.co.uk . In the meantime keep reading everyone! I’m not making this up look. 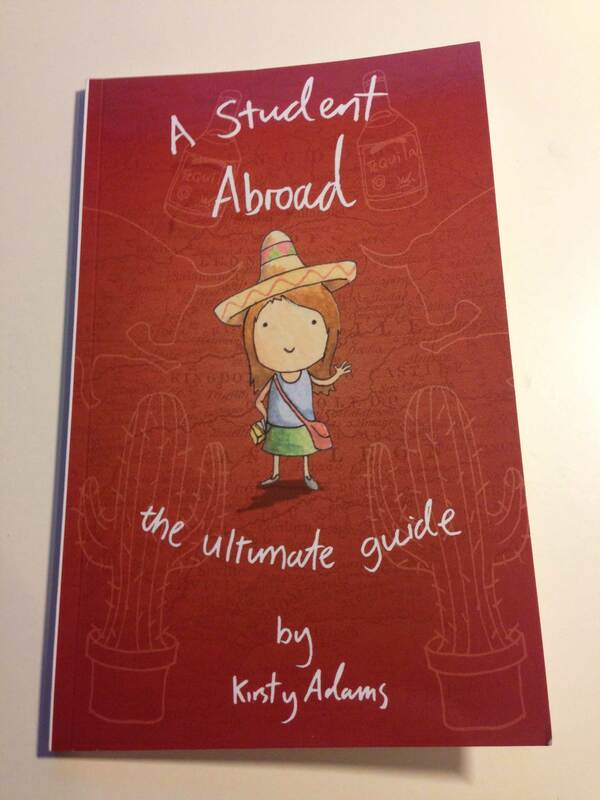 The book itself is a lovely little guide to travelling/working or doing a placement abroad. I know it’s aimed at the student market but I’d say the information in there would be handy to anyone embarking on a big trip. The book is available here or from most Glasgow universities. Hope you’re all well! 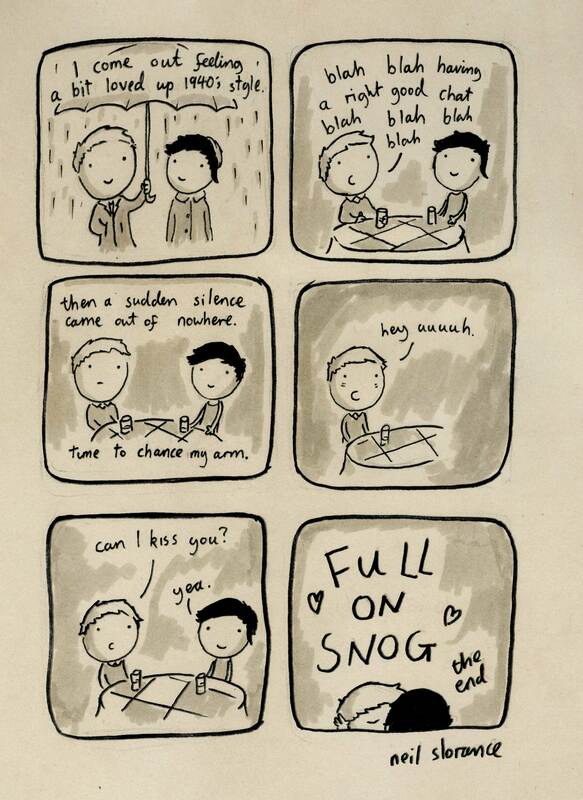 To celebrate Valentine’s day I’d like to show you a wee five page soppy comic. Enjoy! Happy Valentine’s day, whatever you’re doing. As some of you may know I’m Scottish and today is Burns night (an annual celebration of our favourite bard Robert Burns). Some of you may also know that the traditional Burns night dish is haggis! 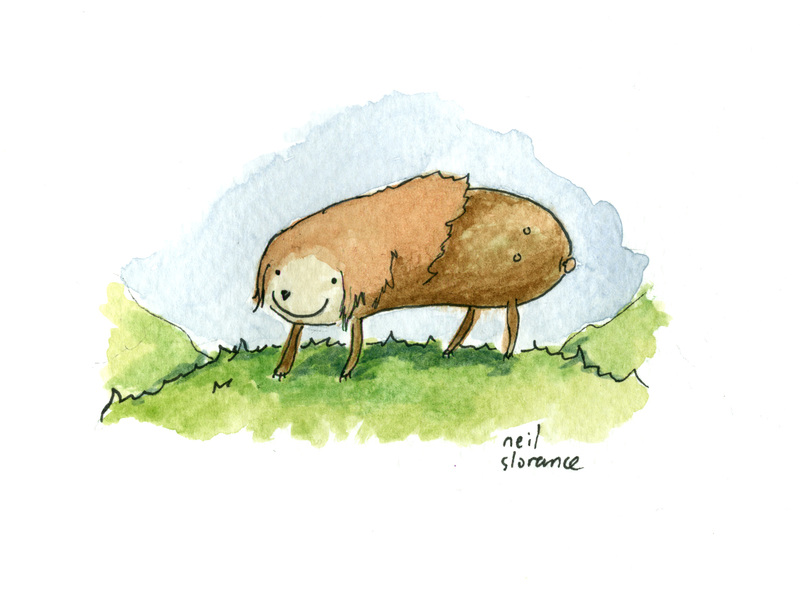 And for the benefit of those not familiar with haggis I have taken the time to illustrate one for you. Above is your typical wild mountain haggis. Typically a haggis has 4 feet, 2 are shorter on one side. This is for running up mountains sideways. Haggii are also extremely tasty and because of this are extremely rare so they’re only hunted during the first month of the year and you need a special haggis licence. Anyways, happy Burns night everyone! What to do about guns. I wouldn’t really call myself political. I mean, I have my views and opinions obviously but I don’t tend to voice them over the internet or put them into my pictures. But to contradict myself entirely I’m going to vent a wee opinion right now: I don’t like political cartooning. You know the one’s you find in newspapers with caricatures of politicians and celebrities? I have no love for them whatsoever. Although there is something I hate even more and that’s guns. I hate all the guns. Every single one, especially people behind guns that think it’s okay to shoot other people. So I made a comic presenting a possible alternative. Now, I should point out here that I don’t approve of violence towards animals. However, if I could choose between animals being shot or given a fair fight I’d much rather they were able to defend themselves. Tea eh? Tea is just great. 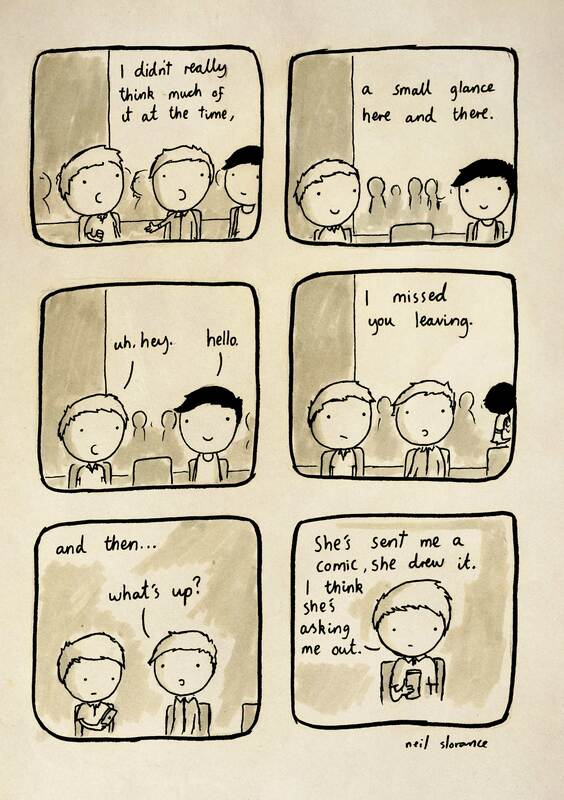 I love tea so much I made a comic about it. That right there is a prime illustrated example of the beneficial effects of having a nice cup of tea. Personally I like coming home, sticking the kettle on, getting that tea bag in there (with a sweetener as I am an old lady) putting the hot water in and squishing the hell out of that tea bag like there’s no tomorrow before putting in a wee bit of milk. Y’know sometimes a nice cup of tea just sorts you out. That’s what inspired the comic actually. Maybe it’s the effects of being somewhat a caffeine addict but after my first sip I tend to feel a lot more focused, relaxed and ready to do whatever work I’ve got on that day. 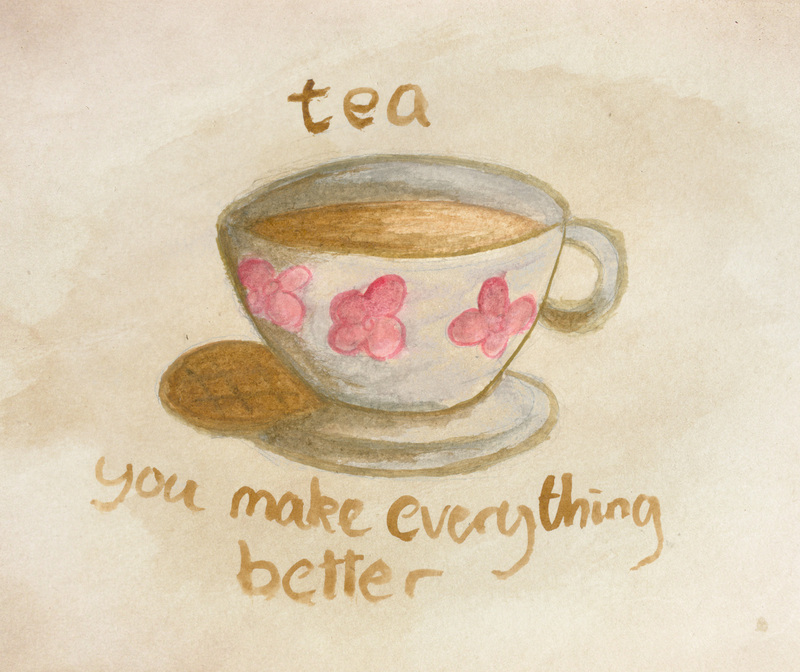 Jings I could bang on about tea all day, actually nah, I’ll just draw another picture. I actually used real tea to illustrate this. 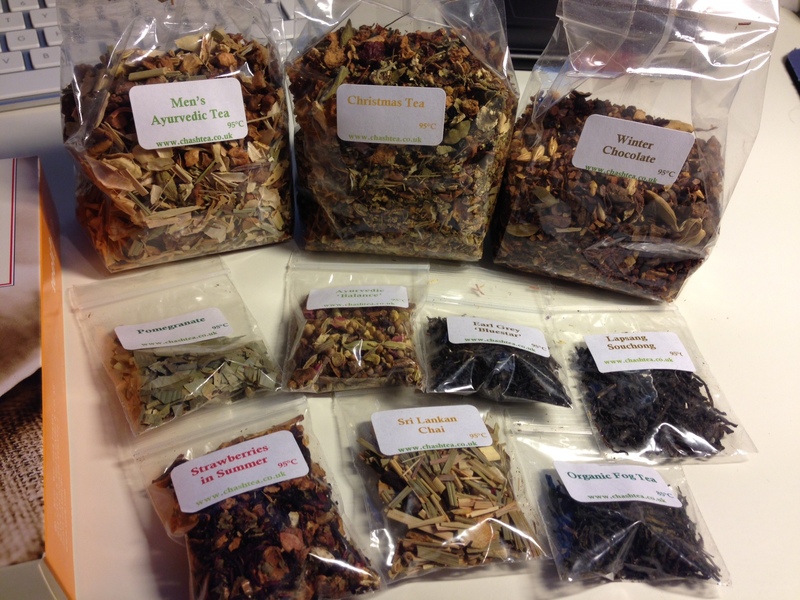 Actually the other day I got an offer to exchange one of my pictures for a box full of tea from Chash Tea and as you can imagine I wasn’t going to pass that up JUST LOOK AT IT ALL. I’ve sampled most of these and I have to say this is grade A tea which has been superbly made with care and attention. Right I’m off to put the kettle on. It’s been a bad year for astronomy and space fans. It doesn’t seem that long ago I was blogging about Neil Armstrong and now I’m back to talk about Patrick Moore. I guess it’s one of life’s great truisms that you don’t know what’s there till it’s gone. I grew up listening to this big wise owl of a man talking passionately and eccentrically about all things spacey. 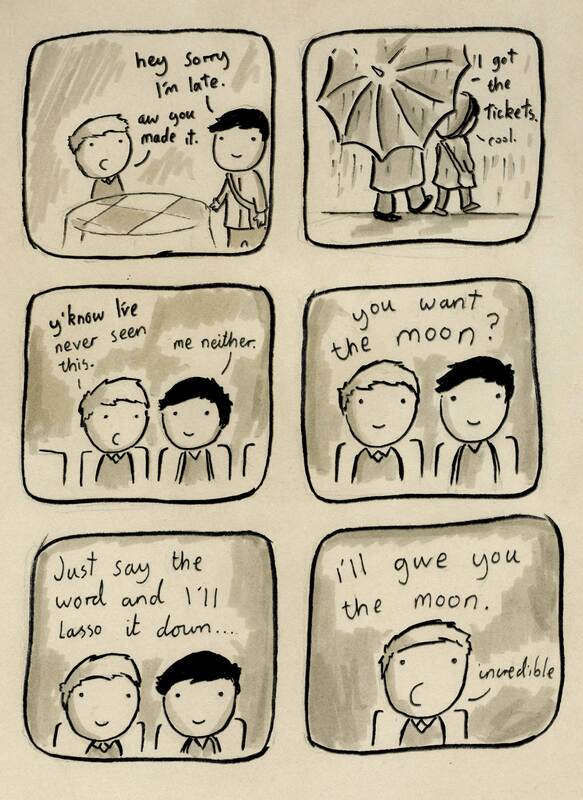 In my late teens I had bought a telescope. I devoured Sky at Night episodes and bought the magazine every month to see what planets were where and how to find galaxies or what meteor showers to look out for. I was also a big fan of Patrick’s articles, which at the same time were intriguing and informative but more importantly they were accessible. Most of all he had a fantastic talent for inspiring people (probably every British astronomer for the past 50 years) and talking about space in a way that almost made it magical. I just wanted to say thanks, in the only way I could. Right I’m off to have a wee bubble. Watercolour Illustrations: How I do them. Hey Everyone hope you’re all well! Today we’re gonna have a wee art lesson, I’m going to show you how I make my watercolour illustrations! Now keep in mind, the way I do things is not gospel it’s just how I like to do things and it works for me. Today I’m going to be drawing my favourite X-man Gambit! Now obviously in my style it’s not going to look anything like that but you’ve got to work with what you got and we’ll start by pencilling out our gambit. It’s pretty rough but I quite like the pose so let’s stick with it. Next I’m going to ink over the pencils, I use fineliners (or sometimes brush ink) in this case I’m using a 0.1 pen. I sometimes also use a 0.3 for thicker lines. These guys are good pens. Okay so I’ve penned over my Gambit and rubbed out the pencil from underneath with an eraser, he’s looking like this. Now it’s painting time! I’m using mid range watercolours, Windsor and Newton Cotmans to be exact. Brush wise I’m using a small flat head for colouring in and a small round for finer bits. Also for a palette I’m using a plate covered with tin foil, basically so I don’t have to clean it (when I’m done I just put the foil in the bin). Now, with watercolours there is a strict rule of working from light to dark, following that rule I’m going to colour my Gambit in with the lightest shades possible. You can do this by really watering down your colours. I should also mention I keep a scrap of paper handy to test my colours before they go on the page. I should also mention I’m using 300gsm watercolour paper. Right, now it’s starting to take shape I’m going to start adding in darker tones. It’s very important at this stage to choose where the light might be coming from in this illustration, hypothetically the sun is to Gambits right hand side so his left hand side will be darker. While I’m doing this I sometimes use a damp brush to blend the dark and light tones. He’s looking sweet! Now I’m gonna add a very thin and watery layer of pink around his cards for effect. I’m also gonna make him say something funny. Now you might not be as funny as me but that’s totally cool, everything in time. 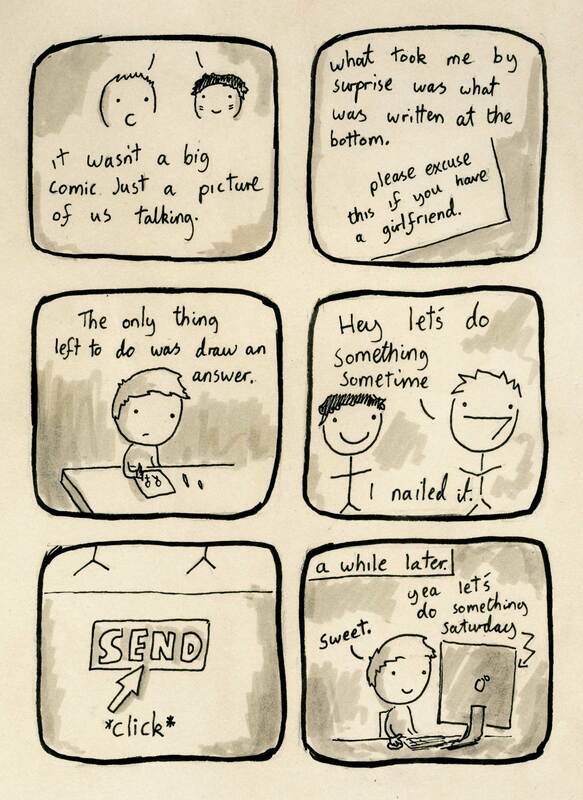 It is also very important to SIGN YOUR WORK or it’ll turn up on reddit with 2 million views and no credit (true story). Right once it’s dry it’s time to scan it in. In photoshop I might brighten it up with the levels adjustment and that’s it that’s how I do it! Thanks for reading I hope someone out there found this helpful! Yeap, that time of the year is creeping up on us again and this year I’ve got something really cool to show you! 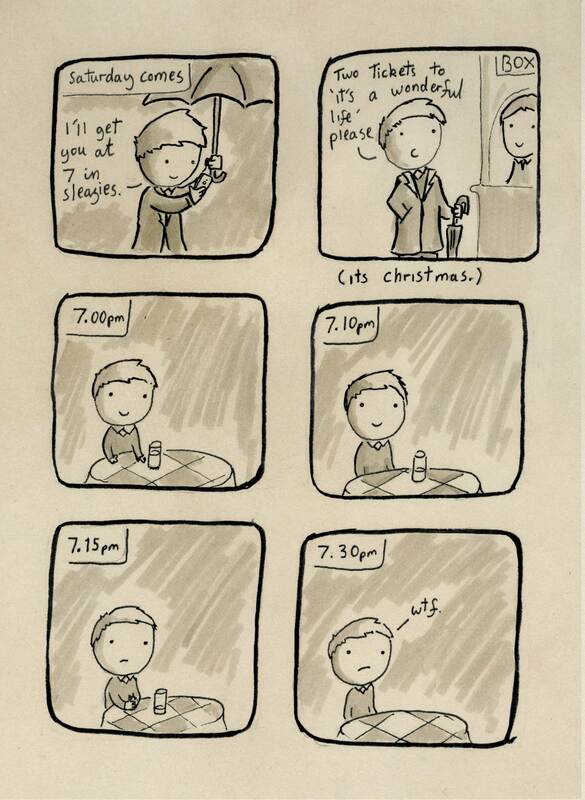 It’s the limited edition Neil Slorance Christmas card collection! Wow arn’t they cool!? Let’s look closer! These lovely cards come in a set of 5 and includes 5 lovely red envelopes too. The sets are limited and are only £6($9) and I’ll write you a wee note with them too. You can get them direct from my Etsy Store! It’s almost halloween wooooooooooo (that’s a a ghost noise) and I’ve got some cool stuff to show you! Spooky wooky! Our ghost necklaces and broaches start at £10 and can be bought from the Bonnie Bling shop! Spooktacular! 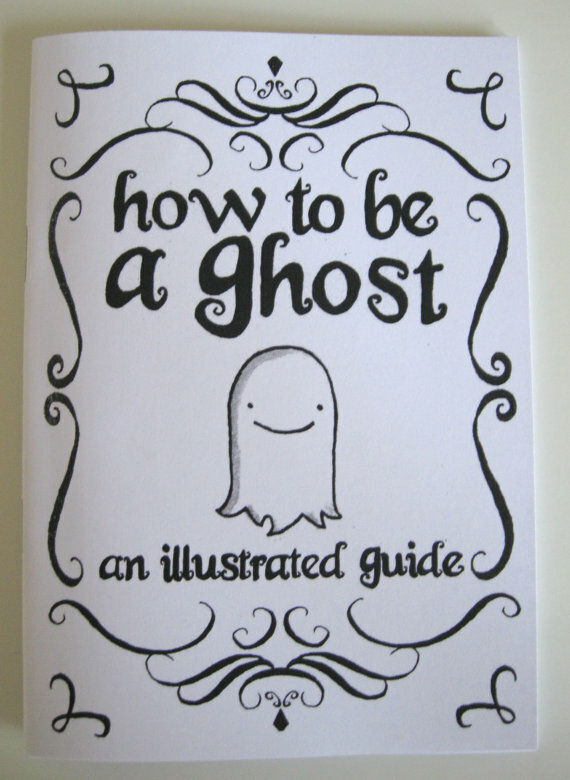 Also on the subject of ghosts, the ‘How to be a ghost’ book is availible from my Etsy store for only £4! Have a great halloween everyone!